A basketball challenge in progress in GTA San Andreas; CJ is seen throwing a basketball to a basketball hoop. Basketball is a sport in the Grand Theft Auto series, most prominently available as an interactive game in Grand Theft Auto: San Andreas. 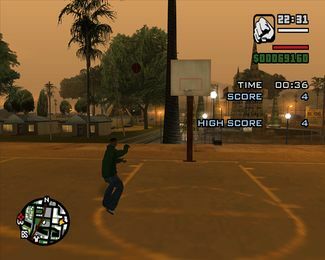 While many basketball courts can be seen through the series, only Grand Theft Auto: San Andreas allows the player to actually play basketball. The player can score points by throwing the ball into a basketball hoop — the farther the distance, the more points the player gets — but has little to benefit from it other than having bragging rights. The player can also do tricks like spinning the ball with CJ's finger, or executing slam dunks by moving closer towards the hoop. Although the player can't play with others and can only play with him/herself in GTA San Andreas, they can activate a mini-challenge to attain the most number of scores within an allocated time. The ability to play basketball is unlocked after completing the mission "Tagging Up Turf", when basketballs may appear in basketball courts. In the original PS2 version, it is available in the beginning. This is a list of locations of basketball courts. Saving at Madd Dogg's Crib sometimes disables the option to play basketball or pool. This page was last modified on 10 August 2012, at 23:06.